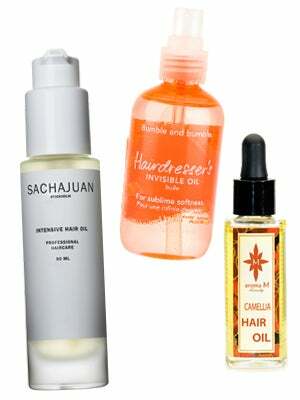 Hair oils are something of an overnight sensation in the beauty world. While they've been used by natural beauty aficionados for ages, in the past five years we've seen a huge boom of oils in the mainstream market. Argan, camellia, jojoba, olive, coconut, almond: It seems like everything you can press some oil out of has become liquid gold for your strands. Not to get all Carrie Bradshaw-voiceover on you all, but have hair oils hit their cultural saturation point? "Hair oils have become somewhat of a 'fad' product," admits hairstylist Sera Sloane. "Even though they are good, they aren't always for everyone. They can be easily overused, causing you to look like you are in need of a shower." However, when used sparingly, adds Bumble and bumble stylist Michael Wilson, hair oils are great for adding shine and softening your strands. The key to making sure your hair doesn't look like a vat of French fry oil was dumped on top of it? "It's always best to keep the oil away from where your natural oils come from, so avoid the scalp and roots of your hair and focus on your mid-shaft and ends. Start with less and see how your hair responds [before you add more]," advises Wilson. Adds Sloane, "It's nice to take big sections and use your fingers to rake it through." So which kind of oil is right for you? Coarse, dry, chemically-processed hair does well with nutrient-rich argan oil — it will make your hair silkier, shinier, and easier to style as it nourishes damaged strands. Frizz-prone hair or those hair types susceptible to environmentally-caused damage should seek out coconut oil, which has strengthening and protective qualities. According to Sloane, hair that needs extra love in the moisture department, or those having issues with their scalps should seek out oilve oil — it's lightweight, known to nourish more than most oils, is great for your scalp, and can help prevent dandruff. Sloane and Wilson also like jojoba oil (for its detangling properties) and vitamin E-rich almond oil. As far as application goes, Sloane says that since olive, almond, and jojoba oils are treatment oils, they are better used at night. Argan and coconut, which are considered great for styling, can be used by day. And, while there are plenty of awesome new oils on the market, as seen above, both Sloane and Wilson say that you should remember that hair oils have always been available, long before this beauty boomlet hit, so don't feel like you need to shell out major $$$ in order to get in on the oil rush. Head to a beauty supply store to grab one of the generic brands, or play beauty Betty Crocker and mix up your own at-home hair helper using essential oils from your local natural foods shop. We'll spare you the "smooth operator" puns. Sachajuan Intensive Hair Oil, $45, available at Dermstore; Bumble and bumble Hairdresser's Invisible Oil, $38, available at Bumble and bumble; Aroma M Camellia Hair Oil, $65, available at Aroma M.